Welcome and thanks for stopping by! I love your comments and I read every one! One of my favorite suppliers is releasing some amazing new product today. 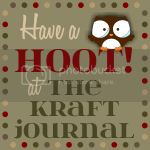 Go visit Papertrey Ink co-owner Nichole's blog for a coupon code, a contest, and to see the new products. I will be posting some videos when I receive my goodies. Enjoy! I hope everybody had a fun weekend! Thanks for participating in the Cricut Card Fairy Army blog hop! I really appreciate the wonderful comments you all left here for my project and my first video, which I enjoyed making very much and plan to make more! "Thanks for the video tutorial. I love this idea! I may make some of these as favors for my daughter's bridal shower... "
kimmiluxich - use the comment form on my blog to send your address or email address and I will get those stamps right out to you! Welcome everyone to the first blog hop hosted by the Cricut Card Fairies this year! It's a Valentine's Day theme that we hope you enjoy! Now on to the blog hop! There are 10 blogs to visit and the hop runs from the 4rd to the 5th. If you have come from Misty's blog, you are in the right place. Wasn't that card she made awesome! It was like a card and scrapbook all in one! Now keeping with the Valentine's Day theme, I have made some super cute and easy treat tins from "upcycled" tin cans. I have posted a video with instructions and also information on the blog candy I will be giving away. Now head over to Joy's blog to see what wonderful creation she has made for the blog hop. It's gorgeous - think HOME DECOR! And don't forget to comment and follow me for a chance to win blog candy, I will be drawing a name some time on Monday. Happy Hopping! It is so nice to be recognized by your fellow bloggers, and I recently was honored with the "Liebster award! Thank you so much, Country Lady Designs! “Liebster” is a German word meaning dearest, beloved or favorite, and the Liebster Award is sort of a chain letter among bloggers that’s intended to showcase exceptional up-and-coming blogs (typically, those with 200 or fewer followers). Now, there’s no evaluation committee or formal award process for the Liebster, but in a way it’s even nicer – it’s recognition that a peer has noticed and appreciated your hard work. Honestly, I could not even begin to choose 5 blogs. After spending about an hour trying to narrow it down, I am just going to award this to all of the blogs I follow! 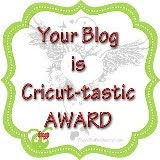 Please feel free to take this award and post it to your blog, from me, with love and hugs!! #99: "Welcome 2012!" Make a "Happy New Year" card using any cartridge(s) and any colors you'd like. Here is my design team card. I have made Miss Hippo here with the big kissy lips before but it was time for a comeback so here she is again ready for her New Year's Eve KISS - 5..4..3..2..1.. Happy New Year!! Isn't she FABULOUS?? I had so much fun making this card, I hope it inspires you to get your own New Years cards going and linked up here by Jan 17th for an entry into Mary's monthly drawing. I can't wait to see what you all have in store for us. And for some really awesome inspiration, check out all the design team projects! Hippo & party hat are cut with Create A Critter, but I hid the facial features using my gypsy, and added the lips I cut from Indie Art, some googly eyes, and drawn on eyelashes. The pucker up was cut from ... hmmmmmm.... I am having a brain cramp and for the life of me can't remember which cartridge has this pucker up phrase... if anybody knows this please feel free to drop it into a comment. N-E-Way... I cut the little flower with a punch and added bling to the center, then covered the petals and Miss Hippo's lips with stickles to give lots of shine and pop. I used my white Sakura gel pen to highlight with dots and dashes, more stickles and that pouffy feather thing on the hat. The sentiment and 2012 were hand written, and I used corner chompers to round and scallop all the corners. I hope you have fun making your own card, be sure to link it up for the challenge! Happy New Year! I needed a few last minute Christmas cards and put together this quick and easy card that might be one of my favorites. A couple of layers, some stamping, pen doodles and a little twine. The stamps are from Recollections - I got them at Michael's a couple of days ago, they had the cutest sets of Christmas stamps for $3.99 each. The Christmas tree was in one set and the sentiment and snow border were in the other set. I added some white dash lines and some sparkle to the tree top with sakura pens, and tied on some MS twine. The white and red papers are PTI and the top layer is Stampin' Up! crumb cake, which is their kraft cardstock - I love it, it is a little paler than most kraft cardstocks. OH - I punched the layers with my new favorite corner chomper - the cloud/scallop one - LOVE it! Thanks for stopping by - have a wonderful Holiday whatever you celebrate! Cricut Cardz Challenge - Tag You're It! It's beginning to look alot like Christmas.... I am singing that in my head because I have been wrapping presents and placing them under the tree! And I have been making gift tags for the Cricut Cardz Challenge - #98 - Tag, You're It! Perfect timing! #98: "Christmas: Tag, You're It!" Make 2 Christmas gift tags using any cartridge(s) and any colors you'd like. Link your project here by January 3rd. I decided to do something a little different so instead of adding cricut cuts to my tags, I used the cuts as masks to ink my tags. Check it out! DO IT YOURSELF: Choose a shape with an interesting border and place a focal image inside the border shape using Cricut Craft Room, Design Studio or Gypsy. (I used CCR and I also cut the tags at the same time.) Lay the tag flat, now keeping the border and focal cuts pieced together, center them on the front panel and attach using repositionable adhesive. Also mask the back section of the tag to keep it free of ink. Next, using a sponge or dauber, ink around the mask to the edge of the tag to make the border. The picture below is after inking. After inking the border, remove the focal image cut from the center of the border shape and add ink to that space. The image below shows my inked focal image, including the detail I added with a pen later. To finish remove the border mask, you should have a tag that looks like you stamped an image and a border. Add extra details with pens or markers, I used sakura pens. This technique is perfect for adding inked images that you may not have a stamp for - but it does work best with mostly solid, silhouette type cuts. Tags cut on Stampin'Up! Crumb Cake cardstock, be sure to cut your masks using a good sturdy cardstock, I used cardstock from Papertrey Ink. Thanks for stopping by and be sure to enter your tags in the challenge! #97: "A Caroling We'll Go!" Make a card for Christmas based on your favorite Christmas song, using any cartridge(s) and any colors you'd like. Here is my DT card. I could not pick a favorite song because I have way too many, so I just picked one of my many favorites. I cut the JOY letters from the Cindy Loo cart at 2". The materials are listed below the picture. HURRY!!! 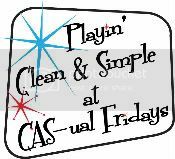 Unlike the other CCC challenges, there is only 1 week to get your entry in for this one! Please enjoy this version of JOY TO THE WORLD by Third Day, it is one of my favorites! Well we are winding down our vacation, just a few more days til we head home but this is the good part - visiting my daughter & family in Arizona. My daughter is a transplant to Yuma from the midwest and she says it still feels weird to her to put up Christmas lights & decorations while wearing t-shirts & flip flops! haha But it sure is looking like Christmas around here. I have one last card that I wanted to post, I made this before we left for vacation. 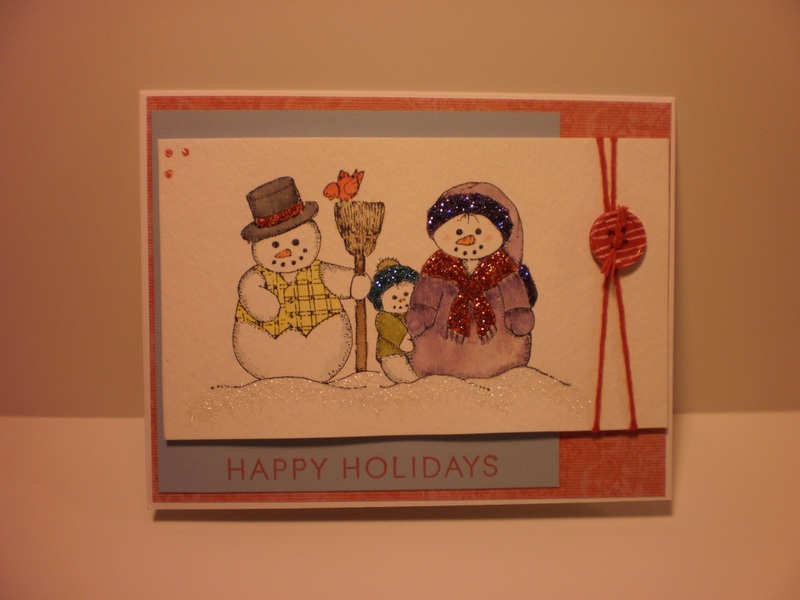 I love this adorable snow family, I watercolored them using distress inks and my aqua painter, then added stickles for the glitzy look. Here is a tip; for my embellishment, I wanted a button with a candy look but I didn't have one so I took a plain red button and drew the white stripes on with my white gel pen. I wasn't sure if it would dry on the button and not smear but it worked perfectly! I will add the stamp name and other mats after I get home because I forgot to bring the list with me and I sure can't remember.... ohwell. Thanks for taking a peek at my card! Hello my friends! I hope everybody had a wonderful Thanksgiving! 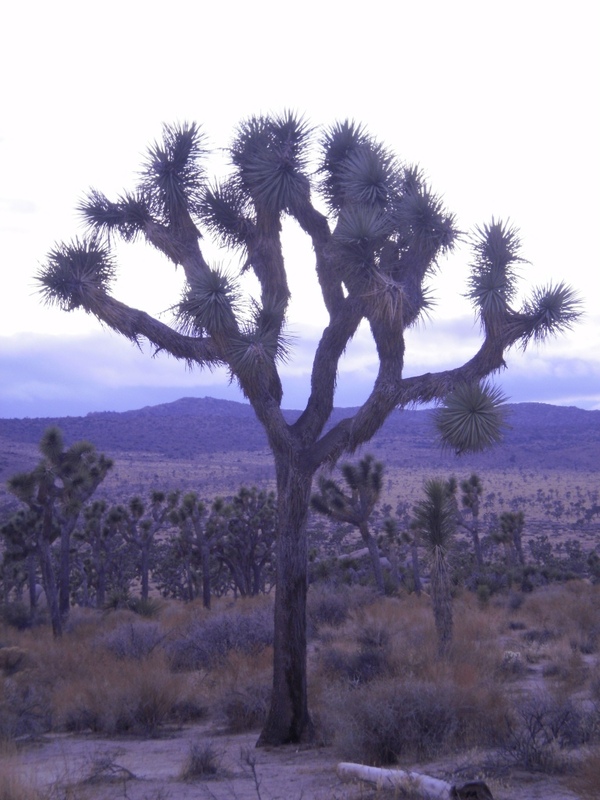 I am still on vacation and had the opportunity to visit the Joshua Tree National Park a few days ago and was so inspired by the beauty there I just wanted to take a moment to be grateful for the Blessings of this earth. Have a safe start to the holiday season everybody! My style is eclectic and I love to try new things. Paper is just a part of my crafting addiction. I live in Michigan with my hubby and 2 cats and wish I could spend more time with my 7 grandkids and their parents. Oh - about my profile pic: this is my sleepy cat, don't you love his blue nail covers! Click the badge to find out more about Cricut Card Fairies. Visit Gina at stampTV for awesome video tutorials!